The COLREGs are dominated by Rule 2 - which essentially provides not just a free pass for breaking all the Rules, but a requirement to do so if the failure to act will cause a collision at sea…! What does the rule actually say? What about a circumstance when you are the stand-on vessel and another skipper on your port side has not indicated in any way that he recognizes that he is about to cross ahead of you? Should you speed ahead to ensure he passes behind you? I wouldn’t - ever! You can stop or, if that is impossible under the circumstances, at least slow or even turn to starboard and try to run parallel to the offending skipper. Hawke saw Olympic on her port side but not reacting to signals and whistles so Hawke put the helm over hard to starboard to attempt to run parallel. Within seconds, the suction effect of the far larger RMS Olympic pulled the HMS Hawke into her. 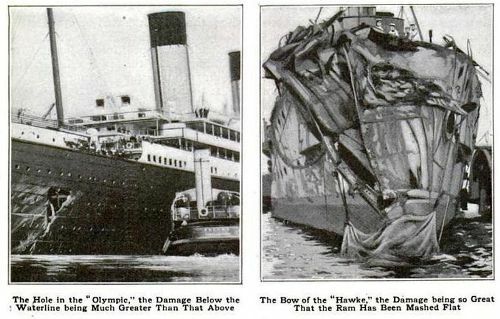 An official Board of Inquiry eventually found largely against Olympic but White Star, the owner of the RMS Olympic, countered that Hawke was at fault as the over-taking vessel and steered directly into her.